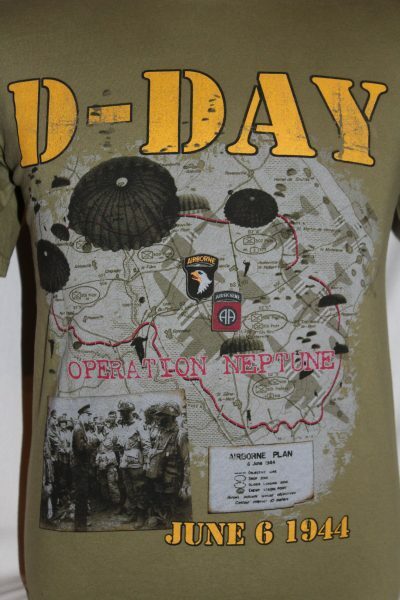 The D-Day Airborne Landings Operation Neptune T-shirt is a single sided print in military green. Front Design Only: D-Day Invasion June 6th 1944 Operation Neptune the Airborne and Glider Infantry Landings by US Army 82nd Airborne Division (All Americans) and 101st Airborne Division (Screaming Eagles). Pigment Garment Dyed shirt. 94% ring spun cotton 6% organic ring spun cotton. 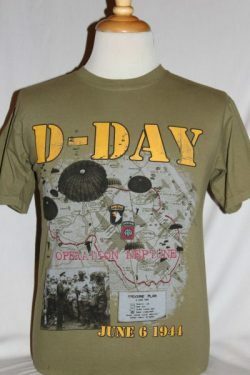 This item is an original Soldier and War product. Be advised it is the only dyed product we have available.